In 2014, I really got back into regular quilting and sewing. 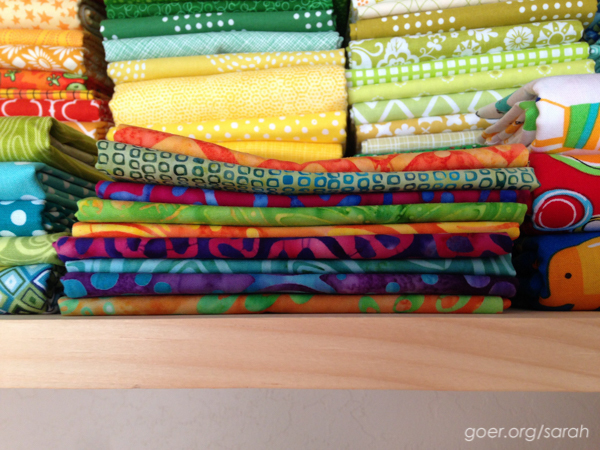 Much of my stash at the start of 2014 was pretty outdated and I was seeing so many great projects being made from newer, more colorful, bold, beautiful, modern fabrics! So naturally, I had to have some. I certainly spent some time doing some quality fabric shopping last year, but I also worked really hard to create my sewing space, prewash all my fabrics that I hadn't yet prewashed over the years (read as: a lot of fabric) as well as to get it organized, a la Jeni Baker's suggestions in her awesome "Art of Choosing" blog series. I have found in my shopping this year that I am a blender addict. The majority of my purchases this year have been tone-on-tone or white-on-color fabrics. 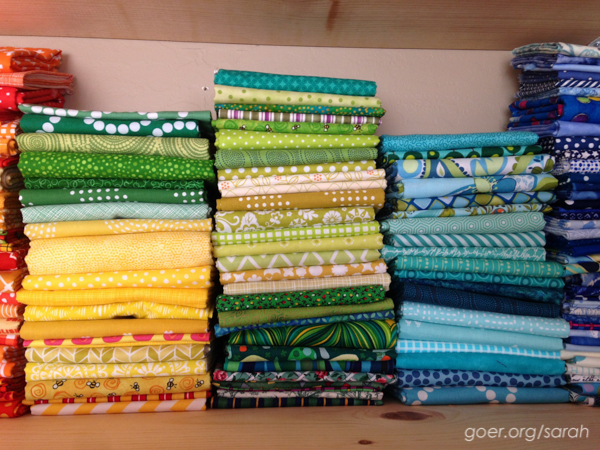 I participated in the Stash Stack Club for a few months (turquoise, citron/lime, orange) which built up my stash in those areas. You'll see my gaps in the rainbow, namely pinks and true greens. I'd also like a few more reds to choose from. 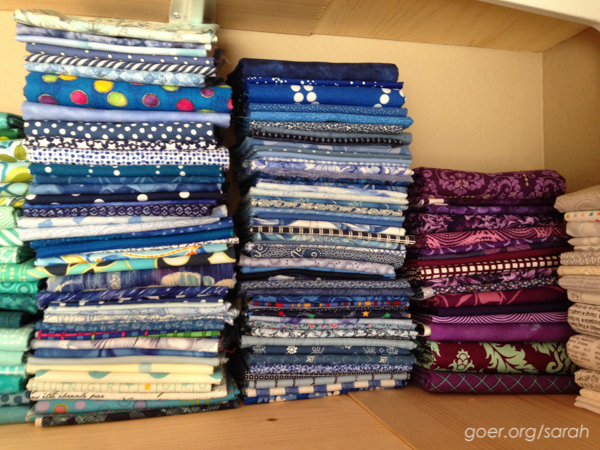 Lots of blues... but many of those are a decade old (originally collected for a bed quilt I was going to make myself when I was single, and never even started) and slightly less than inspiring. I destashed some to a friend recently, but the blues could use some more work. Once I got the stash all organized it made it so easy for me to pull fabrics for projects, or potential projects in some cases. Yeah, I just like to play with my pretty fabrics. Here are a few of my current piles. 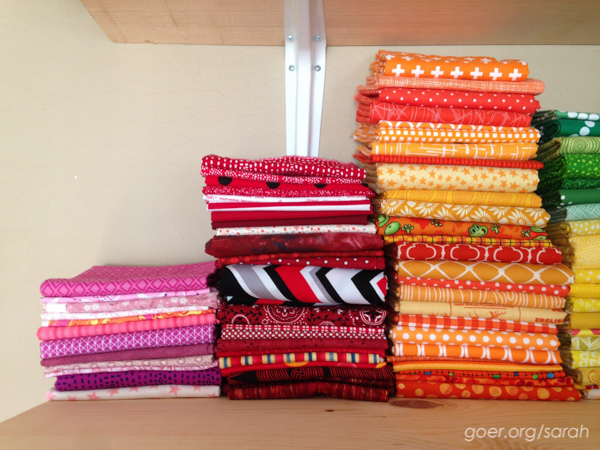 I'm building this first pile for some future quilt project. I'm currently crushing on greens/turquoises/teals. I have a sorely neglected WIP to make my 2.5 year old a cuddle quilt. These batiks will be the fish on her ocean quilt. 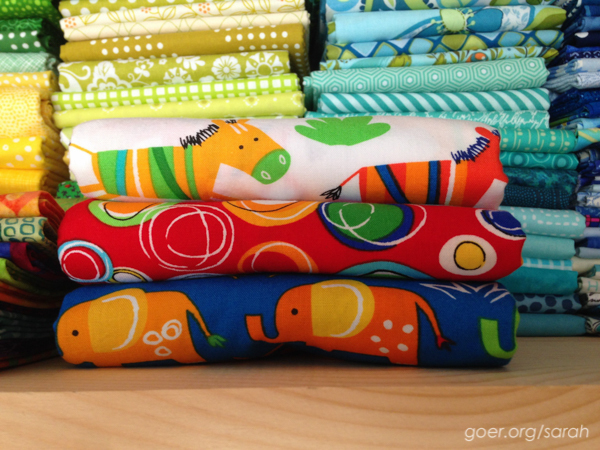 And these cute zebras and elephants will become a baby quilt. Still thinking on a pattern choice for them. Any fabrics that are over a yard I have stored on my mini bolts (cut up foam poster board from the dollar store). Three of those are slated to be backings on specific projects in my current to do list. A few others I'm intending to make children's clothing with. My son will probably use the turtle or octopuses for the backing on his quilt. That said, I'm not in particular need of filling those gaps at the moment. I need to knock out some finishes before I start a fun new project. I'll be linking up to #sewmystash2015 on IG led my Leasa as I use some of what you see above throughout the year. 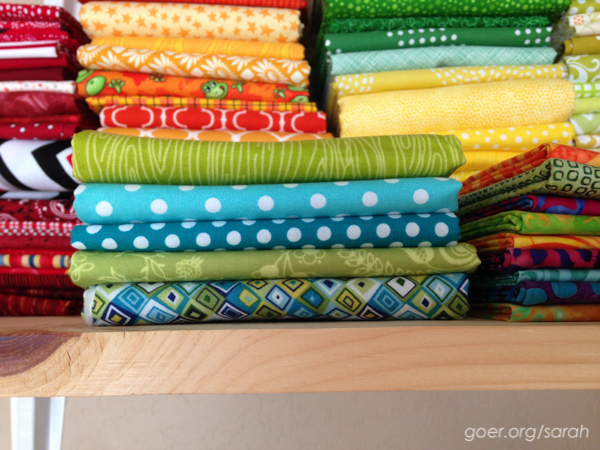 What's in your fabric stash? Posted in Fabric, Quilting. 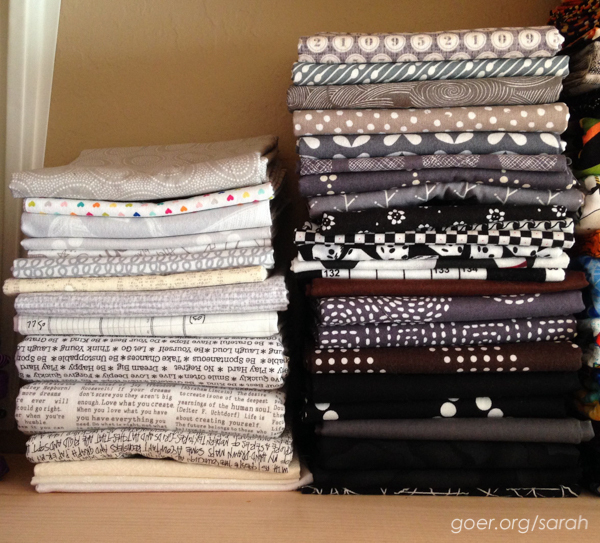 Tags: sewmystash2015 on January 18, 2015 by sarah. Wow, that looks so organized. Mine isn't horrible but not nearly a well placed as yours. Love your stack of purples. Also coveting your grays - my neutrals tend to the warmer creams and tans. Ahhh... gorgeous fabric. 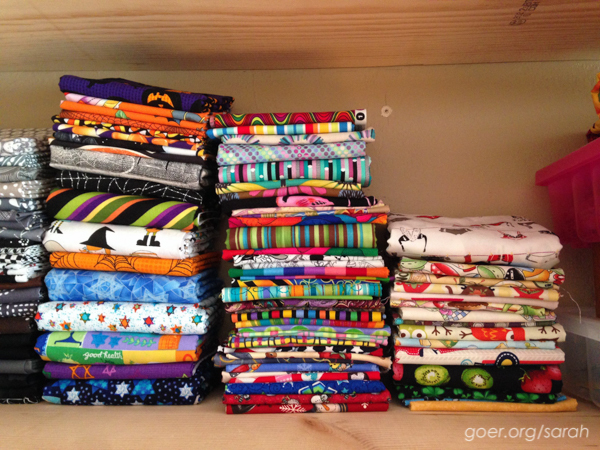 So interesting to see the pictures of your stash and hear how you have it organized. I also have older fabrics I am trying to use up. I've decided that quick, simple quilts are the way to go for me. I haven't really built up a more modern stash, because I have learned that I like buying per project now. Have fun using your stash: new and old. I really need to do this. Looks like I'll be doing my own stash audit soon; Sarah's room is becoming my sewing room once she moves out in a couple of weeks! Organizing an entire room of my own will be...FUN. i've started to take a real liking to grays myself, and find them quite an appealing neutral. your stash looks great. love all the blues! wow that is a great idea to have them stacked by Colour. I think I would have to clean up and do a restack. I just can't separate lines. OCD?? Maybe. I don't ever buy whole lines, so I only have a bit here and a bit there. I do have my few pieces of Tula Pink in a separate pile at the moment.